Diving into our cultural relationship with water in a world where its scarcity is an ever increasing-problem Elixir sees Sadhana Dance continue its navigation of art and science in this evocative mix of choreography, installation, projection and live song. 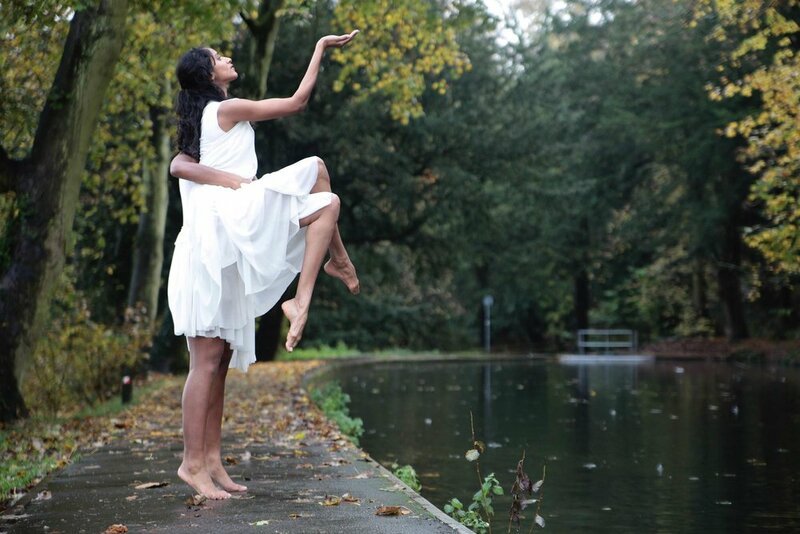 Elixir immerses the audience in the beauty and sound of water as the dancers weave movement rituals, play and daily practices together whilst exploring the struggles and survival of this precious resource. Inspired by Suba’s experiences in the High Arctic with Inuit communities in Nunavut Canada and Greenland Elixir was a collaboration with audio visual artists Kathy Hinde and Matthew Olden, lighting designer Aideen Malone, dramaturg Chris Fogg, costume designer Kate Rigby and musician Divya Kasturi. Elixir toured with a new visual arts installation by the award winning sculptor Josh Baum and a Cafe Sci discussion chaired by Quentin Cooper between the artists, scientists and audiences at each venue. The Place, South East Dance and Activate Performing Arts. Akademi, The Point, UCL Environment Institute and Arts Council England.